Waterproof, durable and flexible with mould protection. Ideal for use in bathrooms and kitchens. Touch dry in 20 minutes. 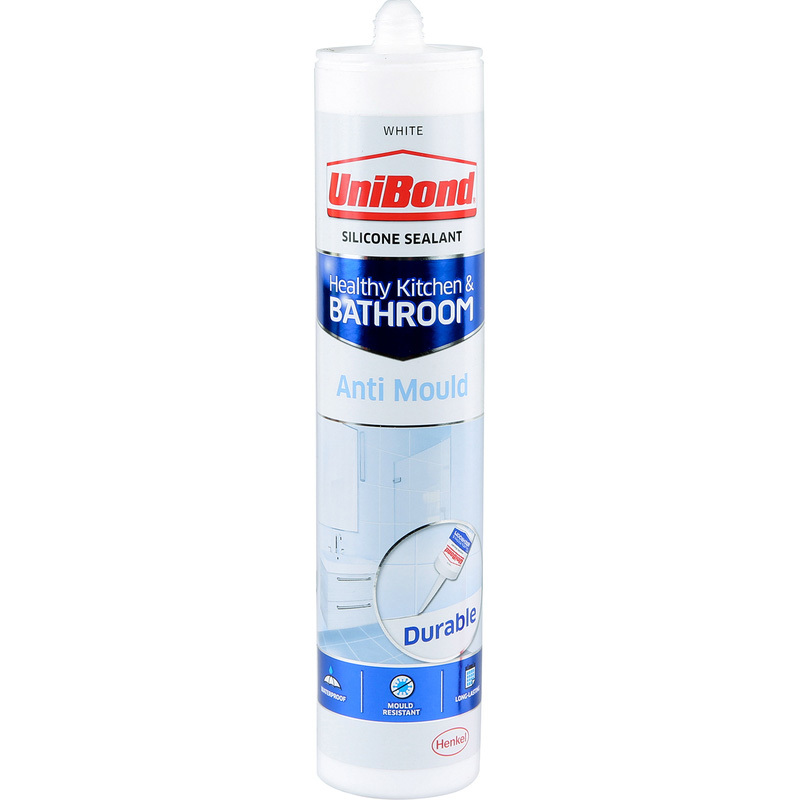 Unibond Anti Mould Sanitary Sealant 274g White is rated 4.8 out of 5 by 14. Rated 5 out of 5 by graham99 from Easy to use Our bath, "professionally installed" about 4 years ago started leaking around the edges. I guess they used a cheap bulk buy sealant. I'm hoping this sealant is a top of the range variant that is going to last longer than 4 years as removing old sealant is a bore. It was easy to use and to get a good finish. Rated 4 out of 5 by peseta from professional product Pleased with this but it doesn't leave much tooling time. I'm sure the professionals don't have any problems. The Vitrex smoother was an invaluable aid - but I found I needed to get it right first time. Next time I'll buy the variation that takes longer to cure. Rated 5 out of 5 by JeffH from Shower tray sealant Certainly not the cheapest, but (IMO) probably the best. Long life before having to re-do. Rated 5 out of 5 by Glenview from Smooth and easy to use I bought this after reading the reviews about how easy it was to use compared with cheaper "own brand" products that I had already bought ready to use. I'm glad that I did to re-seal a shower basin. It went on smoothly and using it with the Vitrex "Silicon Remover and Finisher" tool was a dream. Cheaper own brand products might be as good but I'm sticking with this one from now on. Rated 5 out of 5 by TheHat from Nice finish So far its been a reliable seal with no coming away from bath or tiles, nice finish. Rated 5 out of 5 by Tim4317 from Top quality Use every time, you get what you pay for, cheaper versions loose colour or peel away. If you want a long lasting seal then this is the product, I wouldn’t buy anything less.